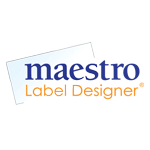 Maestro Label Designer is the premier way to create, design, and print your labels. Maestro Label Designer allows users to easily design and print onto all of the label sizes and configurations offered at OnlineLabels.com. Within the software, customers have access to a library of clipart images, fonts, and more advanced features such as a mail merge tool and a nutrition fact label generator. The application is completely web-based, meaning there are no downloads necessary for it to run. A Maestro Label Designer activation code is included with every purchase. Easy to use - create professional-looking labels in minutes! I LOVE your label designing software! It is great to use, even for me, not a particularly tech-savvy person! Fun and easy to design. I love that they do the printing for you!! ive used a few programs over the years and this one is great. the labels arrive within 48 hours of purchase both times ive ordered via amazon. and this is a very easy program to use. thanks again for the affordable labels and great designing program! Absolutely fantastic! Been using these labels for years- recently had to stop using Avery Designpro as they did not support 64 bit conversion. But Maestro is FANTASTIC! So easy to use and versatile! It's really working wonderfully for us!! We've got a big new job from Barcelona and Online labels has really helped us with this project!!! Completely disappointed in my purchase with Online Labels. I paid $33 for 25 sheets of #OL380SW Cigar Labels. First, their Word template is a blank page with no correlation to where artwork can go in the blocks to print on label. The .pdf is a simple sheet with no ability to eliminate the placement line for the template, and you need Adobe Professional to put illustrations in it. Their Maestro design center is neither intuitive or simple... I've worked in several other software and web-based graphics programs which were far better. After spending several hours and wasting 15+sheets of labels plus regular paper to get my labels aligned (with 4 differently saved versions of the file in Maestro), I called their customer service. After 48 min., another 5 sheets of ruined labels, and 6 more regular print papers, I was able to produce one moderately "ok" page of labels. At that point, I was done.$33+ for 16 off-center labels, after 4+hours of labor. Not a good option.Never again, Online Labels... Never again. Have had lots of success with my labels so far, but just all of a sudden none of my installed fonts are showing up. I have the latest flash and Adobe reader installed but it's still not registering with this software. Where are my fonts!!??? I really like using this software but the fact that I can't use it on a tablet is very annoying, therefore only 3 stars. I was told almost a year ago that an updated version was coming out for use on tablets, but so far, it's still the version that is bound by Adobe Flash. Who uses Flash anymore? Please, Maestro, I need a tablet version!Other than my above gripe, I do like this software, and it is fairly user-friendly. Recently, an updated desktop version was rolled out. The screens in the designer feel more clumsy to me (except the text insertion function) and I am not a fan. I reverted back to the old version's screens. Being able to add fonts and my own images in the label designs is pretty awesome, and there are hundreds of label templates to choose from. All in all, for the price of the license, this is a decent program. They just need to update their device compatability and I will be thrilled. I like this software, when it use to work, but now when ever I try to make a new design, it says that it has encountered an unknown error. If you can get it to work, it's great. Tried Avery, Word, Publisher. Maestro wins hands down. Fantastic materials, software, customer support. Konica Minolta 1690MF is annoying and gets out of alignment, but the labels look great when it is printing correctly.